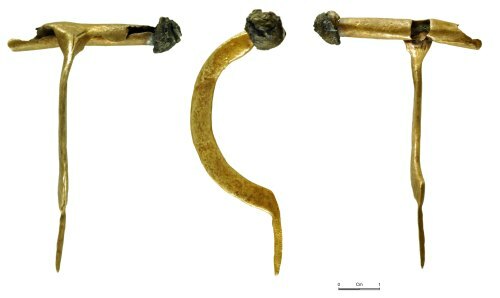 The brooch is fragmentary, missing the pin, most of the foot and the end of one arm (with a surviving length of 64.0mm and a weight of 7.4g). The pin was hinged within sub-circular cylindrical arms formed by rolled sheet copper alloy (with a surviving length of 42.3mm and a diameter of 5.2mm - 6.1mm). The axis bar does not survive and the one surviving knob (9.3mm maximum diameter and 6.9mm long) appears to have been of iron but is no longer ferrous through corrosion. The knob was of uncertain form, possibly conical or hemispherical. The terminals of the rolled arms overlap with the beginning of the knob, suggesting the knob was not of onion form. There does not appear to have been a knob at the head unless a knob was inserted at the apex of the slot for the pin. At the head, the bow is rectangular-sectioned (with a thickness of 5.1mm and a maximum width of 9mm) and narrows sharply to the flat-sectioned bow (with a width of 1.8mm - 2.1mm). The head and bow are also constructed of folded sheet metal, as evidenced by a seam on one side of the head and along the edge of the bow. The bow has the characteristic wide and deep arch (with a depth of 22mm and a length of 44mm). The foot is corroded to a point (with a surviving length of 15.5mm and a surviving width of 2.0mm). The surface is heavily corroded and has been lost and subsequently any surviving applied decoration does not survive. Crossbow type brooches are infrequently reported from Wales, although examples are know from excavations at Segontium and Carmarthen. This example, carefully forged in sheet bronze may be seen as unusual and the probable lack of the central knob would reinforce this. Subsequently, it is difficult to fit the brooch into Keeler's typological groupings of Crossbow brooches. The general form and dimensions (but not the features) are perhaps more consistent with Keeler's Type 1 - 3, perhaps tentatively dated to the mid to late 4th century.